Today we are going to review a new binary options scam called the “Untraceable Trader”. It is presented by Bobby Guinn. There are so many scams abusing binary options, that now scammers point their fingers at other scammers and say: It’s them, not me. The Untraceable Trader is the same. It is a scam not really different from others, but Guinn screams about scammers. But he tells a funny “super secret” story. He wants you to believe that all the automated scams on binary options are created by brokers to discredit automated trading systems. But guess what, the Untraceable Trader is the only honest system that will make you money. It is a lie, of course. The big nonsense in Guinn’s story comes when he talks about buying a trading software for binary options 15 years ago. Because 15 years ago there were no public binary options! The public trading with binary options started only seven years ago in 2008. So this is a proof that the Untraceable Trader is just another scam. But there are many others. 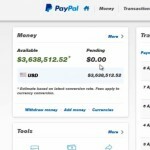 Look at his supposed Paypal account. 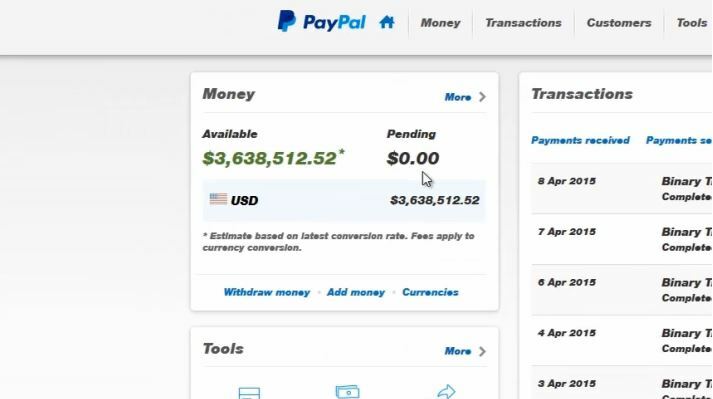 Does a Paypal account looks like this? No, this a fake. Look at your Paypal account and compare. There are some other stupid lies told by Guinn, but let’s go to the purpose of Untraceable Trader. Guinn is a binary options affiliate and he earns money by referring new customers to his broker. He will force you to open a new account and deposit money into it (see first image above), because that will earn him his commissions. If you then trade your account with his system, you will lose your money, that’s it. So don’t fall into his trap. Binary options can make you money, but you have to learn and trade them yourself, no free system will do that for you.